Make classic BBQ sauce at home in less than 5 minutes by taking common sauces and spices and whipping them up in a food processor (so no cooking required!) It's a must-have recipe for countless crowd-pleasing dishes! I have a few store-bought BBQ sauces that I absolutely love, but there have been times when I’ve “somehow” managed to run out right when I need it the most. And by “somehow” I mean I routinely spend whole weeks putting BBQ sauce on everything I possibly can so of course all the sauce is gone because I’ve eaten all of it. Because, why not eat it on everything? It’s one of the best sauces out there! So, seeing as this tasty red blend tends to be an endangered sauce in our house, I had to get my hands on a homemade version that no only 1) tasted just as good as my favorite store-bought and 2) didn’t include extra cooking time. And out of all the need-it-now BBQ sauce recipes I’ve tried, this one was by far the winner. You can whip it up in a blender in less than five minutes! Is it BBQ, barbecue, barbeque, bar-B-Q, or bar-b-cue? I was surprised to discover there are some strong opinions on how to spell the name of this tasty red sauce, so I did a little digging to determine what the “proper” moniker was. All of the above spellings are acceptable. Most dictionaries will use either “barbecue” or “barbeque” as the root word, but the slang forms (meaning BBQ, bar-b-q, and bar-b-cue) have become so common practice that they’re accepted by most spellchecks and grammar fans. Being from the south, I grew up knowing and reading this sauce as “BBQ”, and it’s still what I prefer to this day. What can you make with BBQ sauce? I think the easier question here is what can’t you make with BBQ sauce. It’s just one of those garnishes that manage to make everything better. Should you refrigerate homemade BBQ sauce? For best results, this sauce should be stored in a sealed container and kept chilled. It should stay good in the refrigerator for one to two weeks. Can you freeze BBQ sauce? Yes, you can freeze BBQ sauce, but the quality may vary once thawed. I have only ever made this sauce using “mainstream” brand ingredients (Heinz, etc) and the sauce was still good once thawed. I have not tried other brands or substitutions would perform to know how they would perform. If you have any doubts, be sure to research any of your preferred ingredients. Once you’re ready to freeze, transfer the BBQ sauce to a freezer bag, taking care to remove as much air as possible. BBQ sauce can be frozen for up to three months. 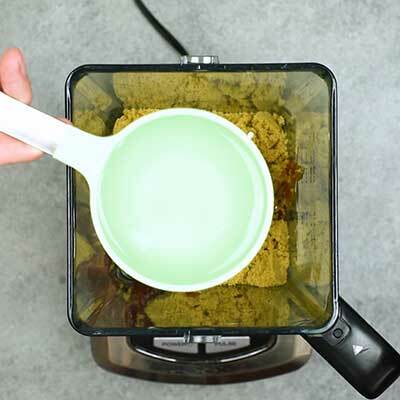 Step 1 – In your favorite food processor, add ketchup, brown sugar, water, red wine vinegar, ground mustard, Worcestershire sauce, salt, and paprika. 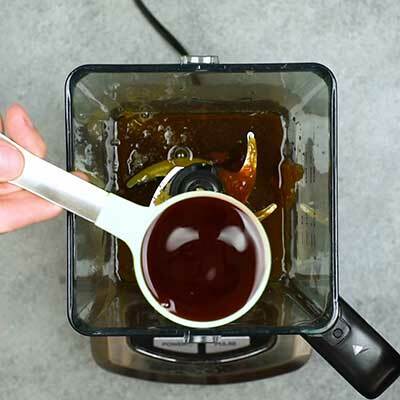 Step 2 – Blend everything together until creamy and incorporated, about two to three minutes. Step 3 – Serve as desired! In a food processor, add ketchup, brown sugar, water, red wine vinegar, ground mustard, Worcestershire sauce, salt, and paprika. Cover and blend until smooth, about 2-3 minutes. This recipe makes about 3 1/2 cups. Looks like a great recipe. I personally don’t like BBQ sauces that are overly sweet or overly vinegary. But home made is always better!